The PCS 80 came with a lot of peripherals: line and character printers, CRT terminals, intelligent keyboards, ACR storage, 8" and 5.25" floppy disks and with several languages: TTY BASIC with OS, 4K, 8K and 12K BASIC, audio cassette BASIC with OS, & a scientifically oriented disk BASIC and level 2 Fortran IV compiler. Numerous photos of his system may be seen here. RAM 2.25 KB (up to 64 KB thanks to RAM boards, there are 4K, 16K, 32K and 64K memory expansion boards). 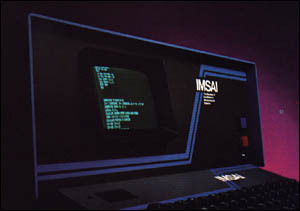 see more IMSAI PCS 80 Ebay auctions !